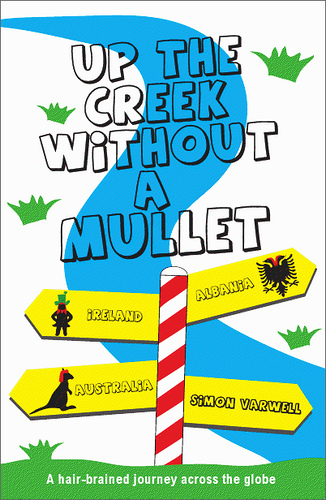 Get Up The Creek Without a Mullet free as an ebook when you sign up to my newsletter. “Up The Creek Without a Mullet”, originally published by Sandstone Press (2010) but self-published in 2015, is my first book. It charts the origins of my mullet mission and the first three adventures in Albania, Ireland and Australia. After acquiring a fascination with the dubious 1980s haircut while travelling around Eastern Europe, I discovered a village in Albania called Mullet, and a mission was born. From Albanian slums to the windswept landscapes of County Mayo, the mission took me across the world in search of obscure locations – eventually creating an inadvertent media storm when the mullet hunting hit the big time Down Under. 10% of my royalties go to aidconvoy.net, a humanitarian organisation run by my friend Kieran. Both he and it feature in the Albanian leg of the story.